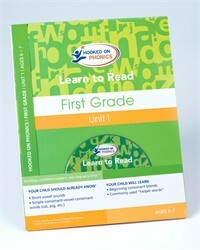 This is the first of two first grade starter pack units offered in a very cost-effective configuration. The kit includes a workbook, DVD with supporting content, a sticker sheet and a storybook that the child who uses this kit will be able to read upon completion. Note: The second first grade level is not available for sale at this time. Do you sell unit 2? I cannot find on the website..? thanks! Hi Megan, we do not sell Unit 2 of these Starter Packs. The clearance page is as is. Sorry for the inconvenience.